A beautiful medium-sized wicker basket perfect for all of your storage needs, the multi-functional storage basket will add style and space to your home. The lovely Moroccan Wicker Basket With a Lid in medium measures 35cm in diameter x 32cm in height. An authentic product the Moroccan Wicker Basket With Lid is lovingly handmade, so it will have the expected lumps, bumps and imperfections of a handmade product. We think that this adds to the beauty and authenticity of the basket. The Medium Moroccan Wicker Basket With Lid is also sold in Large, Small and Extra Small. So why not complete the set giving yourself ample storage for the home. Useful and stylish storage is essential for keeping your home tidy and for creating a harmonious aesthetic in your interiors. With this in mind, Co-founders, Jane Rockett And Lucy St George, sourced the handmade Moroccan Wicker Basket With Lid from Marrakech to solve all of your storage needs. 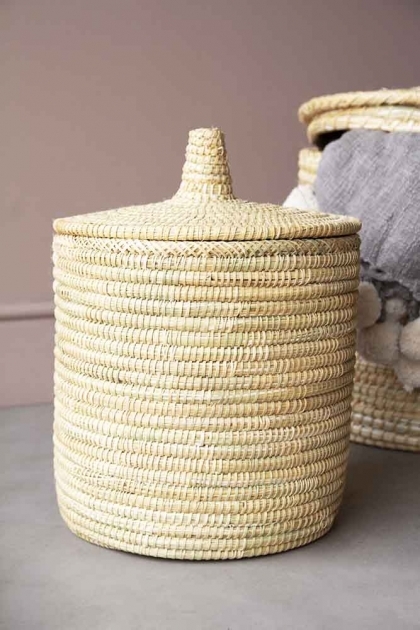 A beautiful Moroccan Wicker Basket With a Detachable Lid, Jane and Lucy ensured that the basket came equipped with a lid so that you can keep anything unsightly out of a sight which is why we think that you will particularly love this basket. The Moroccan Wicker Basket in Medium ideal for storing your clothes, wooden fire logs, kids toys, as a laundry hamper… whatever you choose really! However, if you are using this beautiful basket as a laundry hamper or log basket we do recommend sourcing a cotton lining for the inside of the basket to help preserve this natural storage piece.